Serve the soup hot or at room temperature, with a dollop of creme fraiche and an extra shaving of parmesan with freshly grated nutmeg. Wash the spinach well. Heat up 1L of salted water and boil the spinach until wilted, which should take about 3 minutes. Remove the spinach from the water and leave to drain. Save the water to make the chicken stock from stock cubes, or defrost your homemade chicken stock (best option obviously). In a big pan, heat up the olive oil and cook the onion and garlic until soft. Add the spinach and the chicken stock and mix well. Bring to the boil and then take off the heat immediately. Whizz the content of the pan until smooth and add the parmesan and nutmeg. Mix well and season. Season with a dollop of creme fraiche, extra grating of parmesan and a pinch of freshly grated nutmeg. 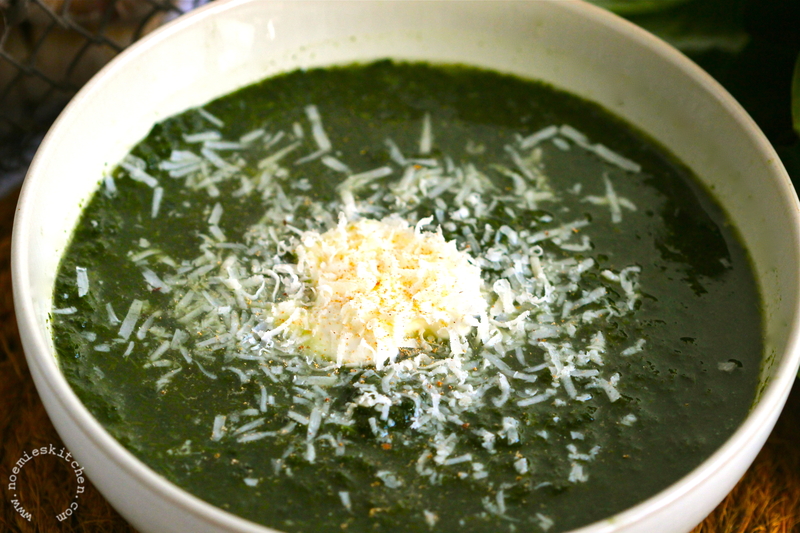 If you decide to freeze the soup, do so before adding the parmesan. 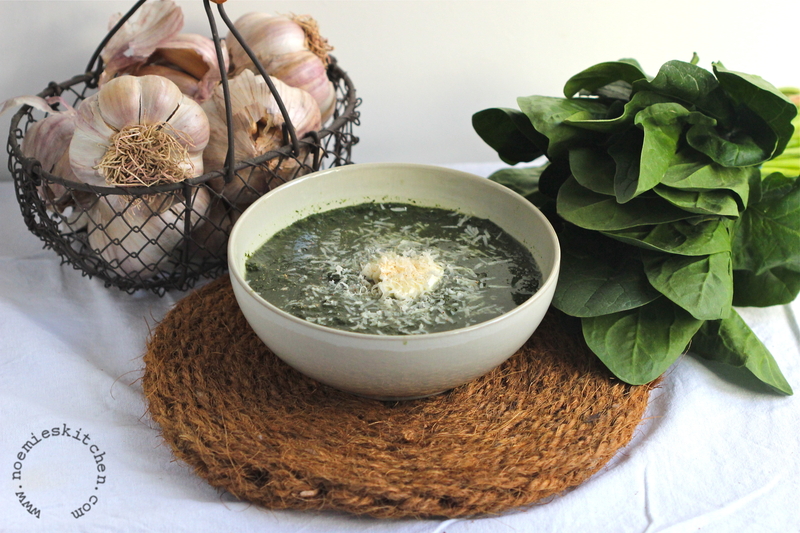 This entry was posted in Recipes and tagged green soup, parmesan soup, spinach soup, winter soup. Bookmark the permalink. This looks great. 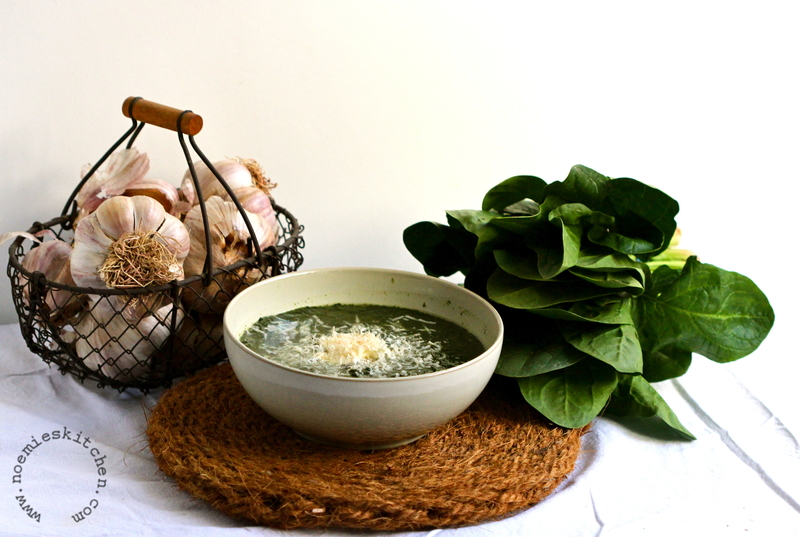 I add a handful or two of spinach to so many soups, but I don’t think that I’ve ever made a ‘spinach soup’. This will definitely go on my to do list! I made this soup again this week end for my mum’s visit and she loved it! It’s surprisingly filling for a soup and with a slice of nice bread it really is enough for a lunch 😉 I hope you’ll like it!